The Giganotosaurus (Jih-guh-not-ah-sor-us), meaning "Giant Southern lizard", is one of the Dinosaurs in ARK: Survival Evolved. It is also simply known as Gigano or even more simply, Giga. Giganotosaurus furiosa is an enormous predator, larger even than the Tyrannosaurus or Spinosaurus. Getting cornered or run down by a Giganotosaurus can mean certain death for nearly any creature! Fighting a Giganotosaurus directly is never a good idea, as its rage rapidly grows with every hit it takes. With this rage, it builds increasing reserves of energy to use, making its iron-jawed bites progressively more deadly and enhancing its stamina. Add to this the fact that its huge body also enables it to take a tremendous amount of punishment, and you have a creature that is generally better avoided or outsmarted than attacked head-on. Taming Giganotosaurus is a dangerous prospect. Its rage reaction, even when tamed, can sometimes cause it to briefly turn on members of its own tribe. Indeed it may even throw off its rider if it has been sufficiently angered! And yet, the sheer size and immense power that the Giganotosaurus possesses means that some factions endeavor to tame it as a fear-inducing “Capital” beast of war, even at great risk! Giganotosaurs will 'casually' stroll about the Island, slaughtering anything in their path, this can lead them to wander to just about anywhere on the Island. Their lack of natural predator, or really any form of threat to them, allows for their safe voyages across the Island. The Giganotosaurus is an aggressive creature. Due to its rage mechanic, it will get angrier when being attacked, which makes its attacks deal more damage. Also, it regains stamina faster when enraged. If it builds up too much rage, it may even eat its own rider, right off the saddle! Its rage mechanic is not a health-percentage based trigger, it only occurs if enough damage occurs quickly enough. It will also trigger even if the server is set to the friendliest possible PvE and no friendly-fire settings, in which normally it is not possible to hurt anything not wild, as well as enraging when it takes fall damage. Due to its large stride, allowing it to walk over most obstacles, and naturally high movement speed, the Giganotosaurus can outrun just about anything on the island. Combined with its very large aggro range this means it is a fast and dangerous predator. The Giganotosaurus is an enormous and ill-tempered predatory dinosaur. Akin to a Tyrannosaurus but three times as large, more teeth, spikier, less armor, and with larger and more powerful grasping arms, and an otherwise more aggressive appearance. This creature feeds mainly on Brontosaurs (to which it is nearly equal in height) but will kill and eat virtually anything it can catch. Its short temper means that (thankfully) it is a solitary hunter and is thus very rare. When enraged, the eyes glow flame yellow. 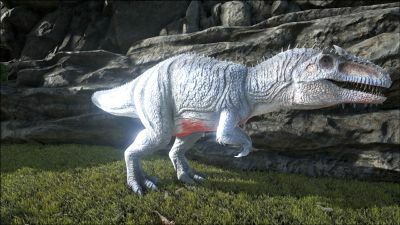 The Giganotosaurus is currently the fifth largest land Creature in the game, with the largest being the King Titan, the second and third being the Forest Titan and Ice Titan, and fourth being the Titanosaur. It is the largest Carnivorous land Creature. This section displays the Giganotosaurus's natural colors and regions. 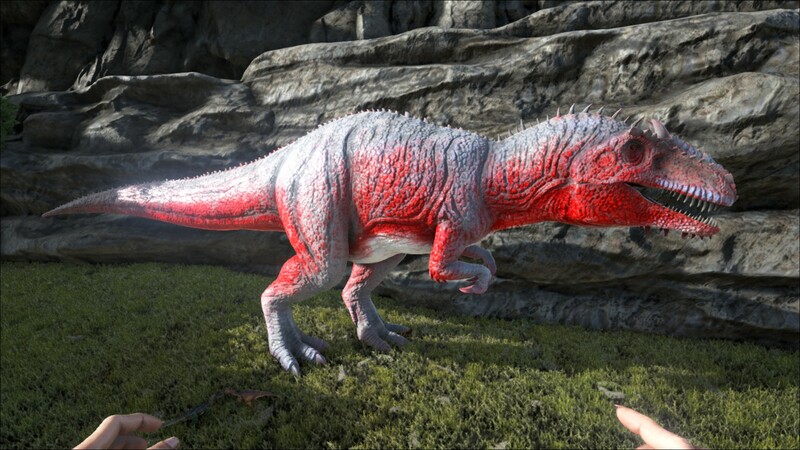 For demonstration, the regions below are colored red over an albino Giganotosaurus. 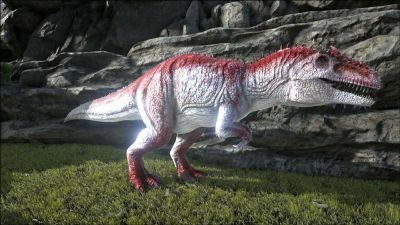 The colored squares shown underneath each region's description are the colors that the Giganotosaurus will randomly spawn with to provide an overall range of its natural color scheme. Hover your cursor over a color to display its name and ID. For example, "cheat SetTargetDinoColor 0 6" would color the Giganotosaurus's "body" magenta. The Giganotosaurus - Tek Cave is a variant of the Giganotosaurus that can be found in the Tek Cave. It is identical to the Giganotosaurus in all aspects. per second for 5 seconds. Using the (PC), (PS4), (Xbox One), the Giganotosaurus bites the target. Using the (PC), (PS4), (Xbox One), the Giganotosaurus unleashes a menacing roar to frighten opposing survivors. The stat-calculator does not work in the mobile-view, see here for alternatives: Apps Note that after the creature is tamed it gets bonuses on some stats depending on the taming effectiveness. This makes it hard to retrieve the levels on a tamed creature, so this tool is only for wild ones, but gives a first impression, how well the stats are distributed. Tranq arrows are absolutely the worst option for knocking a Giga down with the fact the Giganotosaurus has such a high torpor; instead use Toxicant Arrows (ARK: Survival Evolved Mobile exclusive) or even better shocking tranq darts in a longneck rifle. Due to the huge health pool (80k base health) of wild Gigas, you have no reason to worry about accidentally killing it. Also, crossbows being able to fire at roughly double the rate of the longneck rifle proves invaluable when trying to knock out a creature who is capable of shaking off 10k torpor in a matter of seconds. Factor in the cost difference between making tranq darts/shock darts compared to tranq arrows and there is just no contest. Leave the bows at home and bring a high quality rifle (or a few). By far the simplest way to tame Giganotosaurus is to build a room out of Metal Dinosaur Gateway (no gates needed), leaving one side open, and put a Large Bear Trap in the middle. Do not use the snap points, as this will make the room too small to place the fourth wall, and allow the Giganotosaurus to escape. Instead, leave a foot or two gap in between each gateway. You then lure the Giganotosaurus in so that it'll get stuck in the bear trap, then fill in the remaining wall with another Metal Dinosaur Gateway. The Giga will be unable to escape the enclosure and you can shoot at it until it's down. Settle in, it may take a while. It is advised to only use this method as the methods that involve fliers are much harder and much more annoying, especially the Quetzal method which due to the flier nerf is also potentially quite dangerous. Another strategy (which is much harder) is to use a Quetzal with a platform saddle and a shooting platform built on it and to simply follow the Giga around and shoot it with tranq arrows until it falls down. This method is very time consuming and difficult due to the tendency of wild dinos to pick a direction and sprint flat out away from you when they realize they are being tranquilized. Couple this with the surprising speed of a wild Giga and you're in for a long chase. The addition of Griffins gives you another option—no need to dismount, but remember they don't have as much stamina. Don't over-focus and wind up coming to a forced landing right in front of your Giga. Once knocked out, it's rather simple to keep the beast down for the duration of the tame. Simply let its torpor get low (not too low) and then spam a few hundred narcotics into it. It is highly recommended to learn how narcotic works before taming a Giga. Due to the incredibly high amount of torpor Gigas have though, you will usually be able to feed it enough or almost enough narcotic to last the entire tame in one shot. This allows for the player(s) to simply set a timer to come back when it's ready to feed or when it will need more narcotic since no land animal or dinosaur will attack a wild Giga. Another strategy a player can utilize is using any type of flyer (preferably fast) with enough stamina to keep it in the air and flying for 1 and a half minutes. To tame the Giganotosaurus, the player should have at the very least 1 Metal Behemoth Gate along with a Metal Behemoth Gate. Then, the player can have at least 3-4 Metal Dinosaur Gateways and place the Dinosaur Gateways down so that it looks like a semi-circle. The straight line would be the behemoth gate and the curved areas would be the Dinosaur Gateways. After the gates have been placed, put some Large Bear Traps (use as many as you want!) in the the semi-circle. Then kite the Giganotosaurus into the trap (makes sure the Behemoth Gate is open). Once the Giganotosaurus is halted by the Large Bear Traps, quickly close the gate and then tranq the Giganotosaurus to your heart's desire. This section describes how to fight against the Giganotosaurus. A Giganotosaurus in the Wild, or tamed, is extremely dangerous, simply because of its massive damage and health. This makes it one of the most deadly creatures on the island (if not the most deadly); even a low level wild Giganotosaurus can be a very serious threat. Avoid it if you don't want to get devoured in one or two bites. Nine times out of ten, it is best to avoid combat with a Giga at all costs due to their devastating attacks and high health pool. Conventional weapons can damage Gigas, but do very little against their huge health, and are thus not advised. Using a Lightning Wyvern or a Poison Wyvern, a rider can position the wyvern above the Giga and attack it from above using breath attacks. A player can also use a Managarmr and constantly shoot it with ice breath, and jump out of harm's way when the pursuing Giga gets too close. Griffins may make it possible to kill a Giga, as a rider can use weapons while flying. Make certain to have multiple spare assault rifles, fabricated sniper rifles, and rocket launchers; with the Giga's massive health pool, some may break during your hunt. You will also need a huge stockpile of ammo. You will probably need to level the Griffin for weight, unless the Giga is far enough away from anything important that you have enough time to run back to base and rearm. Remember that although you control steering with the A and D keys while using weapons on a Griffin, your pitch still follows where you're looking; if you're looking sideways and down at the Giga and suddenly decide to sprint forward, you won't go straight to the Giga, but you will go down where it can get you if it's faster than you are. Stay high. Remember to stop, gain some distance and replenish your Griffin's stamina periodically; a forced landing right in front of the Giga is not ideal. The Phoenix has a fireball attack (right click) that can allow you to attack a Giga from overhead without it getting angry in response, unless you get too close. The DoT deals up to 100 damage per second for 10 seconds. This means it would take at least 80 fireballs and 800 seconds to kill it. While it's a slow process, it's fairly reliable and safe since the Phoenix does not have to land to regain stamina. Keep in mind that the Phoenix will not get kill credit unless a different source of damage from the Phoenix kills it. Another possibility is to build a raft with a massive broadside of Minigun Turrets, fully stocked with ammo, and a generator; lure the Giga into the water and let the turrets shred it. If the turrets fail to kill the Giga before running out of ammunition you should at least be able to get clear, as Gigas are slow swimmers; try to lure it further into the water and hope that either it drowns, or aquatic predators can finish it off. If fighting against tamed Gigas in PvP, they are not near as much of a threat. While still a terrifying foe, Gigas lose 63k health and 80% melee when tamed, dropping them to a much more manageable 17k base health and making low level Gigas do less damage than a high melee rex. This means that a group of solid rexes can take on an enemy tamed Giga (bonus if the Rexes are Mate boosted). Auto turrets can also shred a tamed Giga fairly quickly if you have enough of them. If attacking tamed Gigas, using 2-3 rpgs to enrage it and cause it to attack any other enemy dinos near it is a good strategy. If you do not have access to explosives, dinos that reflect damage such as the Kentrosaurus are very effective at fending off a ridden Giga; due to changes in the rage mechanics, raw damage is factored as opposed to mitigated damage. This can cause a Giga to enrage by biting a herd of Kentros, no matter how good of a saddle it has. Even if the Giga is unridden, the sheer amount of reflected damage from Kentros can kill an attacking tamed Giga. The only dino that can kill a wild Giganotosaurus head-on is the Titanosaur. Wild Gigas avoid attacking them, with good reason. A few stomp attacks made by a Titan is enough to kill the strongest Giga. However, the odds of anyone just so happening to have a Titanosaur on hand to spare for this battle of behemoths are slim, so it is generally best to avoid the dangerous predator at all costs. As of the new Extinction update, the new Titans can also kill them pretty fast. However consider you can’t have a Titan on any map except Extinction. It's possible to kill a Giga with just a Grappling Hook and a short-range weapon like a Sword. Shoot the Grappling Hook at the back of the Giga, close to his tail and reel-in. When you are close to his body you can hit it with your Sword without a lot to risk getting hit by the Giga. Make sure to have good Armor to withstand occasional hits. A large amount of Auto Turrets can pose a major threat to the Giganotosaurus, as they can deal a lot of damage quickly. The Mini-gun and Rocket turrets can be very effective against a Giga. At one point they could be mounted on the Quetzal, but they are no longer able to be, leaving a raft as the only mobile option for bringing turrets to a Giga. Fortunately, Gigas are slow swimmers. 4-6 Plant Species X can effectively push back a Giganotosaurus, but they do not do very much damage. They are ideal for keeping it at bay while another source of damage is applied or even Torpor to begin the taming process. Be careful as to not let one come from the side. It makes it take a little longer for all the plants to target and could potentially stop a plant from shooting due to line-of-sight. The Giganotosaurus can, and will, instantly kill all but the hardiest of dinos. This, coupled with its health reserves, heavy bleeding, and its rage mechanic make it the most dangerous dino in the game. The Giganotosaurus's torpor will drain faster than it will rise, this makes it hard to solo tame. A Crossbow is recommended due to the higher fire rate than a longneck rifle. The Giganotosaurus can attack according to this discussion up to 8-12 foundations high and 8-10 foundations beyond a wall. The Giganotosaurus is very vulnerable in the water. Its low stamina and slow swim speed can cause it to drown very quickly. However, its massive size will keep it out of most water. A wild Giga can easily be lured into deep water and drowned. Another effective way of killing a Giganotosaurus is to use Lightning and Poison Wyverns, it will make easy work of any Giga you will encounter if you hover above it and pound it with breath attacks for a while. Make sure you watch your positioning as the wyvern's hitbox is massive when flying in place and you may unexpectedly get bit a few times. It's also critical to watch your stamina and to fly somewhere safe to refill stamina when needed. As mentioned in the General section, Gigas are vulnerable to flying units with ranged attacks, such as Wyverns and the Phoenix. Poison Wyverns double as an extra threat to the rider of a tamed Giga while Lighting Wyverns deal some of the highest possible DPS in a relatively safe fashion to wild Gigas. When the Giganotosaurus enters rage mode, its eyes glow bright yellow — an ominous sign to warn enemies and allies alike of its boosted damage and resistance modifiers. In this state it is a force to be reckoned with, even rivaling the power of other menacing giants like the Dragon and even the DodoRex. If it is tamed it will throw its rider off and attack everything around it, excluding allied tamed Giganotosaurs. All nearby allied Giganotosaurs will also then enter rage mode, causing a domino effect that can be devastating. This effect will last for 20 seconds, which is more than enough time for a catastrophic amount of destruction to occur. In the past, Gigas used to gain rage from fall damage. However this mechanic has been removed. At the same time, changes were made to make rage buildup factor in raw damage as opposed to mitigated damage. This is to prevent high saddle quality from causing a Giga to not enrage since damage was minimal enough to prevent the mechanic from coming into effect. Tank: With inherently high HP and base damage, Giganotosaurus is long lasting. Just as long as you watch its Rage, you will last with it. Siege Engine: As one of the few tameable land-based Dino capable of destroying Stone structures, it is logical to employ this beast upon your enemies. So long as it is kept calm, The Giganotosaurus can level months of work in mere minutes. Guardian: The Giga is a fantastic guardian against natural threats since it easily handles nearly everything that gets in its proximity. If you're likely to come under heavy attack by rival Survivors, however, it may be best to have your Giga guard one of the approaches to your base, some distance from the actual structures; that way, if the enemy induces a rage mode (assuming it's being ridden,) only they are punished if the rider can escape fast enough or even charge into the opposition to bring the Giga their way. Taming Support Hunter: Very few creatures gather Raw Prime Meat and get it where it's needed faster. Just remember not to step on your tame, and consider putting your Giga on passive so it doesn't step on or accidentally eat the tame while trying to kill something else. Transport: While even a specialty bred one cannot carry a whole lot, there's no denying that using a Giganotosaurus to transport items/materials from here to there is a safe choice. Even if it means multiple trips, a Giganotosaurus carrier will guarantee an almost complete immunity from attacks and theft as very, very few are brave enough to take it on. Alpha Hunting: Considering the strength of a Giganotosaurus, it is no surprise that it can quite easily handle alpha Raptors and alpha Carnos in most cases regardless of the level of your Giganotosaurus and the alpha. However, a common question is whether the Giganotosaurus will fare well against an alpha Rex. In most all cases, a Giganotosaurus will defeat an alpha Rex so long as the alpha Rex level does not greatly exceed that of the Giganotosaurus. If in a fight with a high level alpha Rex, regardless of your Giganotosaurus level, there is a chance of the Giganotosaurus raging. Should the Giganotosaurus rage, it is best to run as quickly as possible, but even if rage is enduced the Giganotosaurus will most likely proceed to win the fight. A Giganotosaurus with good melee and even just base health of 17,000 can win against most alpha Rexs. Titan Killer: A horde of imprinted Gigas can take on the Forest Titan and even the Frost Titan thanks to their large health pool and insane damage output. If your Giga army is small (less than 8) then it's heavily advised to bring additional firepower. Neither of these titans can cause a Giga to auto-enrage. As a rider, make sure you are on something that can dodge their attacks such as a Managarmr. Riding a Giganotosaurus will award the "Giga Rider" achievement. The size of the "Giganotosaurus furiosa" is perhaps inspired by a mutant Giganotosaurus from Dino Crisis 2, the latter measures 21 meter long and 7 meter high (even though ARK's Giga's size is more than 2 Rexes), whereas real-world Giganotosaurus is believed to have been similar in size to real-world Tyrannosaurus Rex; in fact, it's not yet certain whether they were actually larger or not, and if they were, the difference was slight. While the Giganotosaurus is the strongest tamable permanent creature, its status in ARK is heavily exaggerated. In reality, Giga's had around the same strength of a Rex. This is demonstrated quite well in another dinosaur game known as The Isle. Besides Alpha Predators and the DodoRex, it's one of the only six land-based creatures able to destroy stone structures. The other creatures are the Titanosaur, Rock Elemental, Therizinosaur, Arthropluera, and Chalicotherium. Until the Dunkleosteus' release in Patch 238.0, it was the only tameable dino that could demolish stone structures. The Giganotosaurus is capable of a roar ability. This makes it the third creature with the ability to roar, behind the Tyrannosaurus and the Direwolf. Unlike the others, its roar has no purpose other than feeling ferocious. The Giganotosaurus swims extremely slowly. This combined with its low stamina means it can drown very quickly if attempting to cross a large and deep body of water, its large HP will not save it. Fortunately it is tall enough that most of the time it can simply wade through. Note that on level 1, a Giganotosaurus is actually a lot more powerful than even an Alpha T-Rex. The Giga gains little stats aside from melee damage as levels progress while the Alpha Rex gains both health and melee at normal rates. Gigas can have trouble with rocks, making areas like snow a pain to travel with them on following. It is much easier to have a friend trail behind and break rocks for you or just simply ride it. Taking a Giga egg is an extremely bad idea if you're not prepared. It's best to have an extremely fast flying mount or there will be major consequences. The Giga eats constantly while sprinting, and in fact its Food stat will decrease more quickly than it can eat even with its inventory full. The rider needs to ensure that it keeps meat in its inventory when on the move, and in addition to recharging stamina, sometimes make longer stops to eat and recover the Food stat. It is confirmed that the Giga will have a tek tier helmet that would allow it to shoot lasers. Its scientific name comes from modern Latin, from Greek gigas ‘giant’ + nótios ‘southern’ + sauros ‘lizard.’. In real life, Giganotosaurus was only slightly larger than T. rex, and that was only on average; individual variations were greater than the differences between species. Spinosaurus was, in fact, the largest of the three. Despite its similar shape and size to T. rex, Giganotosaurus isn't closely related, being closer to the Allosaurus than to the coelurosaurian Tyrannosaurus. The Giganotosaurus is too heavy to be teleported to Boss Arenas, despite what Mei Yin's Explorer Note #26 says; detailing how she brought a Giganotosaurus ("Demon King") with her to fight against the Megapithecus. The Giganotosaurus is one of the three creatures with the Gnashed effect, with the others being the Allosaurus and the Ravager. This could tie in to how the real-life Giga is related to the Allosaurus. Corrupted Giganotosaurus don't have the Gnashed ability. Giganotosaurus(including variants) seems to have a bug with its enrage feature; while it will get increased damage as its rage increases, the moment it actually enrages, it loses the bonus damage while its rage mode is active. With this in mind, it's advised to try to supply immediate burst damage to activate rage mode, which in turn, will make dealing with it a lesser hassle. Despite the fact that Allosaurus will not aggro on a spino they do aggro on tamed gigas, and since Allosaurs deal alot of damage in a short amount of time it will send your giga into rage mode. This page was last edited on 23 April 2019, at 00:07.